Neurohumors and neurohormones are physiologically active substances produced by the nervous systems of vertebrates and invertebrates. They have certain features in common and differ in others. Both are chemical messengers that are intermittently released from nerve cells to act on neuronal or non-neuronal effector cells. Significant characteristics of the regulatory mechanisms controlled by these two classes of neurochemical mediators concern the spatial relationship between site of origin of mediator and effector cell; the duration of the signal; the chemical nature of the active principles involved; and the ultrastructural features of their intracellular storage sites. Neurohumors: In “chemical synaptic transmission” the messenger substance elicits strictly localized postsynaptic responses of very short duration in effector cells that are contiguous with the respective presynaptic terminals. 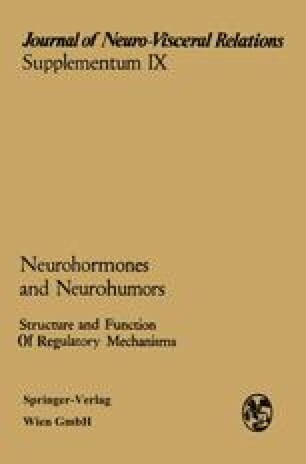 The active principles (e. g., acetylcholine, noradrenaline) lack several essential attributes of endocrine substances and are, therefore, more appropriately classified as “chemical transmitters”, “neurotransmitters”, or “neurohumors” in contradistinction to “neurohormones”. Electron micrographs of cholinergic neurons show small electron-lucent vesicles that are especially abundant in presynaptic areas. There is circumstantial evidence that these “synaptic vesicles” are intracellular storage sites of acetylcholine. Adrenergic axons and terminals (with deposits of noradrenaline as demonstrated by fluorescence microscopy) contain varying amounts of dense-core vesicles which seem to harbor some of this catecholamine. Neurohormones: Aside from synaptic transmission, neurons communicate with effector cells by means of hormonal mediators. However, this activity is restricted to specialized cell groups within the nervous system which possess glandular attributes above and beyond those of conventional neurons and which, because of their dual nature, are called “neurosecretory cells”. Their product (“neurosecretory material”) contains active principles capable of regulating multiple and diverse “target” cells (by bridging considerable distances via vascular channels) and of acting for sustained periods of time. These attributes parallel those of non-neuronal endocrine factors and serve to classify neurosecretory mediators as “neurohormones”. Typical examples are polypeptides (e. g., vasopressin, oxytocin) bound to carrier proteins (neurophysins). Under the light microscope, the identification of classical neurosecretory neurons depends on selective staining and histochemical properties. Ultrastructurally, neurosecretory materials appear as membrane-bounded granules of several size ranges and of varying, but usually high, electron density. There is evidence for the existence of a class of neurohormones that differs from the classical by its non-proteinaceous, i. e., catecholamine nature and a somewhat different mode of operation. In certain cases, where neurosecretory neurons appear to control endocrine effector cells by means of “neurosecretomotor junctions”, the chemical mediator cannot be classified as a neurohormone. * Dedicated to the memory of Dr. Tilly Edinger, distinguished scholar, humanitarian, and friend.